Here’s your opportunity to join in and help out! 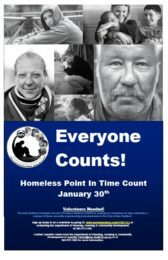 The 2019 Point In Time (PIT) Count is scheduled for a 24 hour period beginning January 30th and running through early afternoon the next day, January 31st. Volunteers are needed; check out the survey monkey for volunteer registration by clicking here. Donations are welcome and can be made by contacting Lauren Lemieux at LLemieux@cssdioc.org.